Olympus Creates World's Smallest Ad | OhGizmo! In addition to cameras, binoculars and other consumer level electronics Olympus is also well known for their line of high-end medical equipment like microscopes. 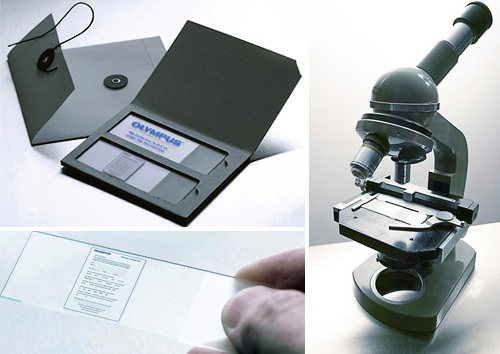 Recently though the company found themselves losing market share to cheaper competitors and in an attempt to reconnect with their high end users they created a unique survey that was actually printed on a specimen slide and could only be read with an actual microscope. The questionnaire slides were sent to a select handful of clients in a special package that mimicked how a real specimen slide would be sent through the mail. While I doubt they received many completed surveys back the company’s website did see a 24% surge in traffic over the period when the slides were sent out. The slides are also currently under a review process to be included in the Guinness Book Of World Records as the world’s smallest questionnaire. I can’t imagine there’d be a lot of competition in that field.